Through papers, photographs, scrapbooks, yearbooks, letters, and more, the Bentley is continually adding to its vast holdings. New items are added quarterly. Some recent accessions from the past six months are listed below, with the exception of University of Michigan record groups. To search for specific materials in the Bentley, please use the U-M Library Search catalog. 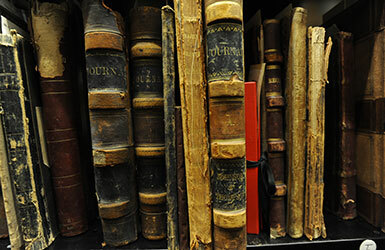 For more information on donating your materials to the Bentley Historical Library, please see our Donate Your Archives page. Democratic senator from Michigan, 1979-2015. The collection documents Carl M. Levin’s 36-year career in the U.S. Senate including his service on the Senate Armed Service Committee, Government and Homeland Security, Subcommittee on Oversight of Government Management, Permanent Subcommittee on Investigations, Great Lakes Task Force, among other leadership positions. Papers include correspondence, speeches, writings, newspaper clippings, legislative and committee files, campaign materials, photographs, audiovisual materials, and other records documenting his personal life and political career. Timekeeper for the construction of the Michigan Central Railway Tunnel. The collection is comprised of photographs and photographic postcards featuring pictures taken by Wells of the various stages of construction of the tunnel, which opened in 1910 and allowed for a more efficient method of transporting rail cars between Detroit and Windsor. Archivist, historian, professor of history and information at the University of Michigan, and director of the Bentley Historical Library from 1981 to 2013. The materials in the collection relate to Blouin’s career at the Bentley, faculty work at the University of Michigan, and various professional activities. Scrapbooks of the University of Michigan students Betty Lou Bidwell Morris (Literature, Science, and the Arts, Class of 1947), and her parents Howard King Bidwell (Engineering and Architecture, Class of 1924) and Ruth Loella Kinney Bidwell, (Literature, Science, and the Arts, Class of 1924). The scrapbooks contain photographs, dance cards, grade reports, identifications, membership cards, and registration cards, announcements, certificates, invitations, programs, newsletters, and letters. Also, Betty Lou’s scrapbook of alumnae and reunion material having to do with the Betsy Barbour Buds. Materials relate to the Bidwells’ student lives, family lives, and social activities, as well as World War II. The fifth chapter of the Alpha Phi Alpha Fraternity, the first intercollegiate Greek-letter fraternity for African American college students. Epsilon Chapter was established at the University of Michigan in April 1909. The collection includes photographs taken at the University of Michigan depict men and women posing in front of the East Catherine Street house as well an interior shot, both circa 1910. Photographs originally taken in New York State and in Chicago, Illinois depict unidentified males circa 1900-1915. Edmore, Mich. farmer. Postcard from Tucker, dated July 25, 1912, offering his body for scientific purposes to the Medical Department of the University of Michigan and a transcript of the same. Also, photocopies from the ledger of the University of Michigan Anatomical Donations Program records (located at the Bentley Historical Library) which show his body was received on December 4, 1914; and a photocopy of Tucker’s death certificate from Montcalm County. Student organization at the University of Michigan established in 1968 for students of African descent. The materials in the collection include minutes, correspondence, agendas, officer reports and topical files on issues including the Michigan Mandate and the 2000 Michigamua protest. The collection also contains photographs, audio/visual recordings, and event flyers. Tann family is a Michigan Jewish family. The Tann family had relatives in Czechoslovakia and Hungary during World War II, the Tennenabum family, who hoped to travel to the United States to escape Nazi persecution. The collection includes biographical information, and original and digitized English translations of correspondence between family members. Many of the letters discuss the political situation in Europe following the Nazi annexation of Czechoslovakia and family’s attempts to obtain visas to travel to the United States. Original material is in Czech, Hungarian, and Slovak, with digitized English translations. Prominent Detroit area businessman and University of Michigan alumnus who served as Regent from 1967-1968. Leader in efforts to bring the Olympic Games to Detroit from the 1950s through the mid-1970s. The collection includes correspondence, meeting minutes, memoranda, reports, financial documents, and photographs. Also, a digitized recording of Detroit’s presentation to the U.S. Olympic Committee in New York on March 18, 1963. St. Louis, MO native, who served with the 310th Army Engineers during the Allied Intervention in Northern Russia in 1918-1919, also known as the Polar Bear Expedition. The collection includes one oversize photo album and loose photographs documenting Johnson’s service and the Polar Bears’ military life, the city of Archangel and other locations in Russia; also Johnson’s biography, letters, military papers, and ephemera related to the Polar Bear Expedition. Charitable organization started by Mandell (Bill) and Madeleine Berman distributing grants in support of Jewish and local Detroit initiatives. Their daughter Sarai Berman Shoup served as an Executive Director. The foundation has an emphasis on supporting the collection and study of data about the Jewish community in the United States. The collection includes correspondence, financial documents, grant recipients files, meeting minutes, photographs, digital files, and scrapbooks related to the operations of the Mandell and Madeleine Berman Foundation and the personal papers of the Berman family. University of Michigan alumnus who was a prominent campus activist and leader on issues of racial, economic, and social injustice during his doctoral studies with the Department of History. McCoy was involved in many activist organizations and campaigns including United Coalition for Racial Justice (UCRJ), the Coalition Against White Supremacy and the Ann Arbor to Ferguson protests. The collection includes correspondence, sound recordings, meeting minutes and notes, topical files, photographs, event programs, and flyers. *Digitized oral history recordings are restricted to the Reading Room of the Bentley Historical Library. Established in 1871, the University of Michigan’s Delta Tau Delta Fraternity is an international social brotherhood and has long been a staple in the University’s Interfraternity Association. The records of the Delta Tau Delta Fraternity comprise of a partially bound photo album featuring photographs of Delta Tau Delta members at the 1912 Junior Hop, membership directories, and letters. David D. Dexter was a cornet player in the University of Michigan Symphony Band. In 1961, the Band toured and performed across the Soviet Union, Eastern Europe, and the Middle East. The collection includes digitized slides, correspondence, diaries, and audio recordings documenting the Band’s experiences and performances. Ann Arbor, MI businessperson, founder of the Brian Connelly & Associates, Inc. The collection includes printed advertisements created by Connelly & Associates, Inc., biographical information about Connelly, as well as market research reports. Also, printed advertisements created by Connelly & Associates, Inc., biographical information about Connelly, as well as market research reports. University of Michigan graduate, Class of 1929, member of the Delta Chi fraternity, the Aces Club and the Trojan Club. Scrapbook contains photographs and ephemera documenting Fisher’s immediate family, friends, travels, and time as a student. Images include depictions of fraternity and social club activities, graduation exercises, major sporting events, and the University of Michigan’s Frosh-Soph Spring and Fall Games. Archeologist, architect, and art historian who led archeological expeditions to Angers, France, Mount Sinai, Egypt, and countries in the Near East including Iraq, Syria, and Turkey. Forsyth was a professor at the University of Michigan, chairman of the History of Art Department and director of the Kelsey Museum. Ilene H. Forsyth, who continued George’s publishing activities posthumously, was an art historian and professor at the University of Michigan. An art historian and professor at the University of Michigan, Ilene H. Forsyth made extensive efforts to publish her husband’s works after his death in 2015. The collection documents the career of George H. Forsyth. Materials include personal and biographical materials, teaching materials, and extensive documentation of George Forsyth’s personal travel and archeological expeditions to Europe and the Near East, such as correspondence, field notes, photographs, drawings, and other visual materials. Ilene Forsyth’s materials document her efforts to publish George Forsyth’s work posthumously. Her materials include manuscripts, correspondence, topical files, and a catalog of drawings. Detroit, Mich. native, Barbara Bassett McIver was part of the second cohort of Peace Corps volunteers and part of the first Peace Corps group to go to the Philippines. The bulk of the material is dated between 1961 and 1964, and includes McIver’s diary, a scrapbook, letters home, and ephemera relating to McIver’s experiences in the Philippines. Also included in the collection are Peace Corps 25th and 50th anniversary program materials. A student at the University of Michigan, College of Literature, Science, and the Arts (Class of 1943).World War II-era scrapbook containing event programs, photographs, publications, various dance, identification, membership, report, and registration cards, reserve officer training ephemera, and other materials reflecting on U-M student life and activities. Arranged into 5 series: 1. Administrative Files; 2. Affiliates and Partnerships; 3. Events; 4. Programs; 5. Publications. The YES Foundation is a non-profit organization formed in 1992 by Julia T. Richie, a former business owner, accountant and University of Michigan-Dearborn alum. The foundation was created to empower children and young adults through the implementation, support, resources, and opportunities in employment, education, and enrichment. The record group also comprises of materials related to various YES Foundation programs including background information, program curriculum, students (cohorts), and program director files for the YES for PREP program. The collection subsequently contains publications created by the YES Foundation, photographs, and digital components.